My nephew, Matt, turned 18 the other day. We celebrate tonight. 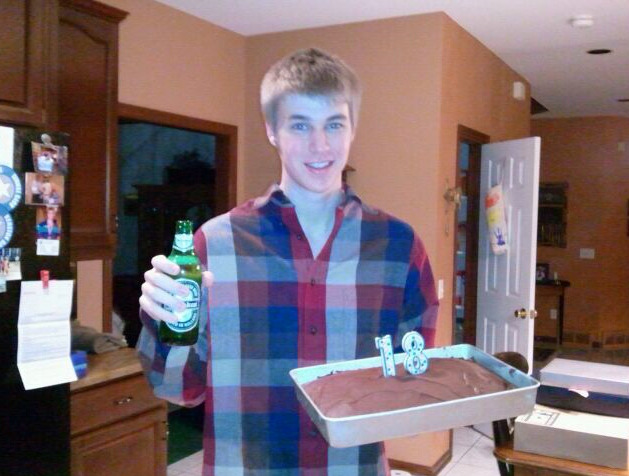 When my sister sent me this picture, I had to remind her he was 18.....not 21. Her response? "oooops". I like to think my nieces and nephews are better behaved than their uncle was at that age. They'd almost have to be. I'm sure this probably wasn't his first beer, but in some ways, I'd like to think it was. I'm a little protective of him. 18 years. Where did the time go? Somewhere in the background, "Sunrise Sunset" is playing - no? I remember the day he came home from the hospital. He wailed when I held him....but so did his sister. I had never held babies before those two. My then 20 month old niece was great....and thought he was great....and then promptly took that bag that came home with him from the hospital and placed it at the door. She was done. He was to be temporary. When Matt was young, I decided I would mold him in my image. Scary, huh? I knew I wouldn't have kids, but I thought he'd be the perfect protegee. And for the most part, it has worked. He has a great sense of humour. He has picked up excellent musical tastes. Well, I guess that's all there is that I can pass along. He's a lot more than I am - a straight A student, a ranked tennis player and he plays guitar, bass and drums. I do have to say, his parents have never dissuaded me from this endeavor of me being his guide. They chuckle at our interaction and anymore he's become quite quick with his verbal jabs. In return when they were young, they were asked who they wanted as guardian if something happened their mom & dad. I got the nod. Their lawyer made it official. Denton and I do a lot with Matt - movies, concerts, stuff like that. I can honestly say, I never had even one day out, let alone attended any events, with any of my uncles as I was growing up. In six month, he'll be away at college. I tease my sister that they'll be all alone and lonely when he's gone, but in reality, so will I. But for now, I will enjoy the time with him. "I never had even one day out, let alone attended any events, with any of my uncles as I was growing up." I think it's great how we can identify the deficiencies of our lives and work to correct them in the next generation. His flannel shirt choices are similar to yours. Hooray for all the people like Matt who are in the world today. Smart and open minded young folks who love their family members regardless of who they sleep with. we need more young people like matt in the world. and such a handsome man also! I love nieces and nephews! You get the best of them. I could always give them back to my sister when they were stinky, sick or misbehaving! You ARE old. Enjoy it! I do. You are also an awesome uncle. Every kid needs one and not all of them get it. Matt is a lucky kid to have you in his life. It is nice to hear some youngster are well behaved; most of the ones I run into are quite frightful.